Tribalism only matters when the tribes are small. I contend that tribal size is an aspect of “maturity” and that maturity can be more measurable than the common definition allows. This filter has value in lots of other places, but that’s a good one to make the point. So what’s the right definition of maturity? Maturity is a measure of the relative size of the time and space units of any given proposition. The bigger the units, the more mature. The smaller the units, the less mature. Longer version: a baby is immature. It’s “space” is it’s body. It’s time is now. A high schooler lives in a bigger social space, and may think of time in terms of test schedules, or Friday to Friday date nights. A parent’s space is bigger yet: work, family, neighborhood, etc. A parent’s time units are larger: college tuition planning, grandchildren, retirement. From infant to old age, the development of maturity in ever increasing time and space units is, I think, clear. Lots of strangeness can be explained if we consider a contraction of one (time or space) without the contraction of the other. So, when tribalism is an issue, it’s because the tribal mindset in question is immature. We may not be able to eliminate tribalism as a pattern in human behavior. But we may be able to evolve it in terms of the time and space units involved — we may be able to “mature” it. When the tribe is the human race, and the time frame is seen in terms of generations, we have a mature, healthy, and beneficial “tribal” mentality. That is, of course, until we encounter little green men and have to “mature” further. This really messes with Haidt’s conception of liberal and conservative distinctions based upon reactions to fear of the tribal/community kind. I haven’t found a variety of tribalism that I’d consider mature. By my understanding it’s always a category error and a lazy habit. It’s always a failure to act upon the higher principle. Maybe I’m not following your premise well enough. Longer version: a baby is immature. It’s “space” is it’s body. It’s time is now. ... ironically, the youngest infants probably lack much of a self/other distinction. A newborn’s ‘space’ may well be ‘everything in its consciousness’, not ‘its body’. So in some sense, if our circle expands out to the largest picture possible, we may complete a sort of loop, vs. finding a linear endpoint. After having acquired much more knowledge, of course, but the basic dynamics may be similar. Tribalism is an innate characteristic of human beings, formed by the evolutionary process. It’s not political or social at its root, although it manifests itself in those and other realms of human endeavor. It is biological. “Birds of a feather flock together.” Nationalism is one of the most prominent manifestations of this aspect of our nature. It’s not going away anytime soon. We define ourselves in large part by the groups with which we identify. IMHO, rather than attempting to rid ourselves of this component of our nature (which would be like trying to rid ourselves of bodily organs), we can learn to manipulate it to our mutual advantage. Tribes can form alliances - that’s what treaties are. Accept our tribalism, then find common grounds with other tribes. That would be the “mature” thing to do. I would argue that the ability to belong to many tribes at the same time is a sign of maturity, just like being able to hold competing ideas in your head at the same time (and being aware of the contradiction) is a sign of intelligence. That may be true, but there are some who urge ecumenicalism, including the Heap Big Tribal Chief - the Pope. However, that’s a very, very big hurdle, do to the divisive nature of religion. Perhaps as cultures intermingle in the modern world, the differences in religion will succumb to the similarities, or just become less important. The reason why some religious people are open to ecumenicalism is because they are also Secularists, i.e. they belong to more than just their faith. In contrast, many evangelicals and of course Muslims have made it abundantly clear that they are true to their beliefs first and foremost, and only accept what doesn’t contradict it. Like being for the Yankees and the Red Sox in the same game? Like I said, tribalism is here to stay for the foreseeable future. Interestingly, I think the answer to this is ‘yes’. We are all ‘for’ the Yankees and the Red Sox in the same game as human beings above and beyond their role as teams. If one team had members of the other team murdered or maimed in order to win, people would be horrified, not reveling in the glory of their team. I think as we get older we are prone to growing in more compassionate discernment (understanding people as their own entities with their own desires, needs, preferences, and so on,) but also more likely to feel like an isolated ‘self’ (I think the huge growth of meditation in this country, with such a focus on feeling just slightly less ‘self’ conscious, speaks to this,) and definitely more protective of what is ‘ours’. In good and bad ways - that can mean increased responsibility, but it can also mean that the openness of youth starts to decrease. If your life is going well, you tend to have more and more to lose as you get older, and have accumulated more experiences of loss so that wariness starts to increase. Aging parents, kids, family, friends, a house, a job, financial savings, a reputation, a self-perception, and on and on - I think there is a reason that Buddha and Jesus were wandering mendicants! For the rest of us, I think the trick is to find some balance in trying to retain the best parts of a youthful ‘beginner’s mind’ mindset and the discernment and ‘expanded circle’ that tends to come with age. When we understand how genes influence human behaviour, we will be able to create a gene therapy that cures tribalism. In many humans the tribal instinct is weaker than in others, think of Albert Schweitzer who devoted his life to helping African even though they are a different “race”. In him, the tribal gene was dormant or non-existent. Views are difficult to measure and statistics must take many factors into consideration. The table posted does not indicate location or country. Or give any definition of the political categories. 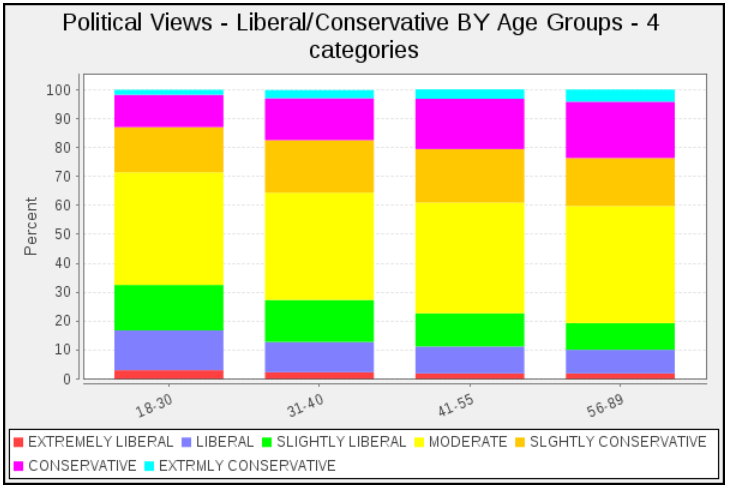 Did the older group become more conservative with age, or were they already more conservative, i.e. born and raised in a different time, different values, etc.? For example, on the issue of gay rights and marriage, in general it appears that younger people are more liberal and accepting. However, many older people have been changing their views over time, re-evaluating and revising their attitudes from those in which they were raised. When we understand how genes influence human behaviour, we will be able to create a gene therapy that cures tribalism. . . .
Are tribal instincts always unjust and in need of being cured? What if your child has health-care needs and insuring this child requires you to work overtime in order to afford it—would you go ahead and work overtime then donate the resulting money to a child in some distant neighborhood or town who has no one looking out after her more urgent medical needs, because your child’s needs aren’t as extreme as the kid you’ve never met? Would you allow your child to become permanently disabled because someone else’s kid who you’ve never met would die if left untreated? If I caused this child’s existence, I have special responsibility for it. So this doesn’t involve tribalism for me. That’s an idiosyncratic definition. But putting that aside, how “special” are your siblings to you?